If you have any concerns about engaging in physical activity, please consult your GP before taking part in cycling sessions. In the event of an injury or illness during a session, Eastlands Velo/Sportcity Velo will take all reasonable steps to reach the designated emergency contact and address the situation appropriately. Eastlands Velo, Sportcity Velo and British Cycling may take photographs and shoot video footage at club and Go-Ride events. We may use these images as a coaching resource (for example, for rider feedback), post them on the club websites and include them in general publicity material. British Cycling may also place them on its website and present them during coach-education courses. We will not publish your or your child’s name unless you have granted your permission. We take reasonable steps to establish a safe environment where young people can enjoy developing their cycling skills. Riders participate in cycling sessions under the instruction of British Cycling–qualified coaches. They do so entirely at their own risk and accept full and sole responsibility for their own safety. 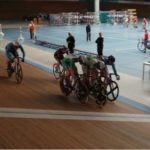 Eastlands Velo and Sportcity Velo cannot be held responsible for any accident, loss or injury during sessions. Parents and guardians agree to consider the nature of such sessions and discuss them with their children. Parents and guardians are responsible for ensuring that their child’s bike is safe to ride. Riders must wear a correctly fitting cycling helmet and track mitts while cycling. Cycling sessions for children younger than 12 will take place at a traffic-free facility. We may invite older riders to sessions on the public highway, but only when the coaches deem them sufficiently responsible, capable and fit. Parents and guardians are welcome but not required to watch sessions. We expect riders to attend sessions from beginning to end. Parents and guardians: If your child must leave early and/or with someone other than you, you must tell club staff the details of the arrangement, including who will be collecting the rider. The club will inform parents and guardians of members under 18 of club activities (including scheduling and transport details). Email to these members will be copied to the designated parent or guardian. We require sporting conduct from all riders. We will exclude from the session any riders who persistently misbehave or put others in danger. Obscene and/or offensive language is strictly forbidden. Eastlands Velo and Sportcity Velo respect your privacy. In accordance with the Data Protection Act 1998, we will hold your personal details in secure electronic and physical storage and use the information solely for the purposes of club administration, such as telling you about events and opportunities and processing membership subscriptions and bookings. Within the club, your data will be available to committee members only, and we will not share it with third parties without your permission. We will retain it while you are a member and for three years after the expiration of your membership. Upon request, we will provide a summary of any personal data we hold. To obtain this summary, contact us at ESCVelo.General@Gmail.com.